I get a lot of emails about leveraged investing and the Smith Manoeuvre. In particular, how to go about “capitalizing the interest”. As you may have read, it is possible to fund the investment loan with the loan itself. This is called capitalizing the interest. Basically, it’s where you withdraw an amount (equal to the monthly interest payment) from the HELOC, and redeposit it as the monthly interest payment. CRA accepts that a loan can pay off the interest charges of another loan while keeping the interest on both loans tax deductible. As a side note, many people have written comments about using the investment loan to buy mutual funds with HIGH distributions. Typically, high distributions include Return OF Capital which is fine providing that you NEVER withdraw them. If ROC distributions are withdrawn from the investment account, the tax deductible portion of the loan will be reduced. Only dividends/interest can be withdrawn without any consequence to the investment loan. Check out “how to keep your investment loan tax deductible” for more information. Back to the topic at hand. 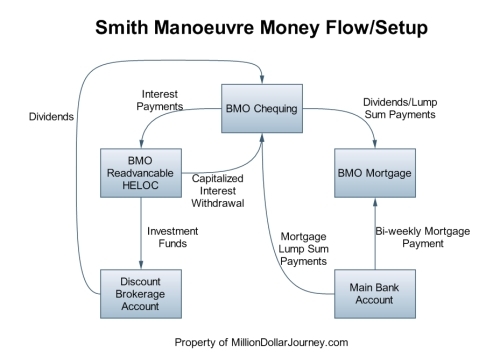 If you look at my Smith Manoeuvre money flow setup below, I have a chequing account setup with BMO solely for the purpose of simplifying the intricacies of the Smith Manoeuvre strategy. Even though it may cost $4/month (unless a $1500 balance is kept), it is worth the few dollars as it will show a proper paper trail if CRA has any questions. The diagram that I whipped together shows exactly how the money will flow from one account to another while properly utilizing The Smith Manoeuvre strategy. Hopefully this will clarify any Smith Manoeuvre money flow questions that you may have. Note that the flow of money may be slightly different with other readvanceable mortgages. To explain a bit further, BMO’s Readiline does not allow direct lump sum payments from an external bank account even if the regular payments are coming from it. We decided it was in our best interest to open a BMO chequing account because of three important reasons. It will provide a means of lump sum payment without visiting the branch. It will give us online access to view balances. Perhaps most importantly, it will provide a clean paper trail for CRA should they need it. Excellent diagram. Very much appreciated!! I would first like to say I am so glad a friend told me about this blog. I have been reading it for a few days and have learned so much already!! I am thinking about getting into this Manoeuvre, however I still have A LOT of research left to do. I gather you have decided to do it on your own, without the help of one of the Smith Manoeuvre financial planners, or the planners from the other agencies/corporations that offer assistance with this manoeuvre. What are the disadvantages to doing it through one of these planners? I am thinking of pursuing it on my own, but am a bit leery because of the possible CRA implications if my records aren’t perfect. That being said, I am also pretty interested in learning the ropes so that I can do it myself (I am a bit of a control freak). I would just like to know what your reasons were for doing it yourself, besides the fact that you seem to know a lot about investing/finances. Do you save a lot of money doing it on your own (not having to pay high management fees and such)?? CSM, the decision to do the Smith Manoeuvre on your own is a personal decision. Personally, I feel comfortable with making my own investment/tax decisions and don’t see a lot of value in getting a planner to do it for me. However, if you don’t have the time or inclination to do your investment/tax research, then it would be wise to get a planner to do it for you. It may cost a few more dollars, but worth it to make sure everything is done correctly. The fees really depend on the planner. You’ll have to contact them individually to see what their rates are. My SM setup is pretty much the same, except I use Scotia’s STEP, with chequing and brokerage. The one additional thing you may want to keep in mind, as far as I know, is that all your trading fees should be paid out of your cheque account as well (cannot be borrowed from LOC, as the interest on it is not deductible). So you may want to add an arrow from BMO chequing to discount brokerage, labeled “trading fees”. It would be good if someone who’s an expert in taxes can just confirm this, but this is how I understand the CRA’s documents. Frank, are you sure that the trading fees should be paid outside of the LOC? I just figured that the trading fees simply increase the ACB of a stock. You mentioned you set up the BMO chequing account to make things “cleaner” should the CRA come looking, which sounds like a sensible idea. However you’re channeling both dividends and mortgage prepayments, neither of which are deductible, through this account as well. Is there a reason you’re not using your main account for this? You do mention that BMO won’t accept mortgage prepayments as preauthorized payments from your main account, but I can’t see them refusing a cheque if you brought one to the branch/ATM. Reducing the many arrows going to and from the BMO chequing account might make the diagram a little easier to understand too. With Scotiabank and the SM, will SMDI allow you to pay for the commissions from your chequing account directly? Or do you just make two transfers to your brokerage account, one from your chequing to cover the commissions and one from your LOC? Unfortunately I have to make two transfers, but since I do buy and hold dividend growth investing, and thus don’t trade much, it’s not really an issue. By the way, I just got my 1st SM tax refund today! I use Quicken to track all our spending, investments, etc., so it was a breeze doing my taxes. Based on the CRA’s statement, it seems it would be prudent to pay for the commissions from dividends or income, not from the LOC. Yes FT, I was wrong – the line you quote says it all, plus I just spoke to an accountant who concurred that you can use part of the borrowed amount to pay for the brokerage fee, i.e. the interest on the brokerage fee is deductible, but obviously not the entire brokerage fee itself. Sorry if I caused some confusion! Do you need a separate brokerage account for the investment portfolio with the SM if you already have non registered investments ? FYI – The Supreme Court of Canada is hearing Earl Lipson, et al. v. Her Majesty the Queen, et al. under the CRA GAAR (General Anti-Avoidance Rule) on interest deductibility of an ‘investment loan’ when there was a residential mortgage involved. If the CRA has their way the Smith Maneuver may be a thing of the past. Let’s hope not. You could basically cancel your BMO chequing account and replace it by a sub-account on your HELOC. You can use that sub-account as a regular account and you should save all banking fees (NBC HELOC doesn’t charge a penny regardless the balance). Hmm… i’m wondering if the BMO readiline supports sub accounts. Interesting concept. P.B, from my research and speaking with legal friends, the lipson case is a bit more complicated than that. I will get a post up about this soon. DJ, I would recommend a separate brokerage account for your leveraged investing for paper trail reasons. There is some more detail on the Lipson case. I’m no tax lawyer, but I can see where the mistakes were made. Definitely not the Smith Manoeuvre, this is a clear tax avoidance scheme. The difference with the SM is that you are borrowing money against your home equity and then using that money to purchase income producing investments. The interest is then deductible against this income. The after-tax income is then yours to do with as you wish. I look forward to your analysis of this, FT. I have the Scotia STEP and I am looking into doing the SM but how do you get them to increase your HELOC for capatizing the interest? since it is not automatically revolving? Do borrow 100% from the HELOC minus 12* the interest payment and then after a year ask for an increase? FT, I’m in the first month (well, first few days actually) of my SM mortgage, and my BMO rep did indicate to me that sub-accounts were available. Also, the big SM mortgage comparison table at http://www.myvirtualmortgagebroker.com/Smith-Manoeuvre-Mortgages-Smith-Maneuver.html shows that 4 lines are available, which I take to mean sub-accounts. I think the new $5000 interest free account in the latest budget in Canada makes the SM redundant and high risk IMO. I must admit the flow chart is a work of art. A picture is worth a thousand words. It does act as a poster child for the Manulife One account, though. There is no additional risk in the SM beyond what leverage you already have – it’s just being moved from bad loans to good loans over time. The SM generates tax deductions, which you can use to fund your $5k savings plan. Sounds complimenatry to me, not either/or. With respect to the ROC component of an investment distribution – it is possible to use this amount to pay back (reduce) the HELOC component of the Smith Manouvre (obviously not the residential mortgage component). The amount can then be reborrowed from the HELOC and invested elsewhere. It will mean keeping track of the ROC component of each distribution, but sometimes that information is not available to the end of the year. While I am not doing a SM, I have borrow against my HELOC to purchase a couple of distribution based investments with ROC Components. I am using all the distributions currently to reduce the HELOC, so I it is not necessary for me to know month to month what the ROC component is. As long as it all goes to HELOC repayment, the HELOC interest remains tax deductible in its entirety. I respectfully disagree on both points. The SM is about converting non-deductible debt to deductible debt, while building a portfolio potentially much larger than $5000 per year. The investments within your SM portfolio carry the same risk as those inside your TFSA. While you could hold GICs in your TFSA, you would not gain much over inflation. I am not saying to avoid the use of TFSA, just include it in your financial plan where it will do the most good. The SM would be particularly practical for individuals who can’t find the $$$$ to put in a TFSA. The SM allows them to build a portfolio without any additional funds. With the exception of FT’s ‘main bank account’, a step only necessary because he does not wish to have all his banking at BMO, just about all the other steps would be needed with M1. You would still need to have a sub account for the deductible portion of the SM, & the brokerage account. The only other addition is a chequing account from which to draw interest payments if you wish to capitalize the interest. For a number of reasons, I prefer to have a chequing account which I can limit funds, rather than have the relatively unlimited funds that could be available in an M1 account. For those of you that are doing the SM with one of the major banks, are there fees to start? There’s also a $40/month fee for this company to manage the investments for you. If after 1 year you feel comfortable enough to do it on your own, you can manage it and they will “discharge” you and you do not have to pay that monthly fee to them anymore. So again, what were the costs to start this with regular banks? At my bank I had to pay the Notary fees to convert to a readvancable product. No appraisal costs, no set up fee, no penalties, kept my low interest rate. I can manage my investments in the same manner as I do my RRSP — no fees beyond the MERs. M1 also doesn’t need a separate mortgage, you forgot about that, and the subaccount can be done on-line, takes 10 seconds literally. SM vs TFSA…how can someone have enough money for SM but not TFSA? Makes no sense. They are just deciding to allocate their funds in once place and not another. SM is leveraging. I don’t think people understand that. That’s way more risk than TFSA. AND the proceeds from the TFSA are tax free….not the SM account that gets built up over time. There is nothing better than tax free. Ask people how their leveraging has been going over the past 12 months. People love their complicated risky leveraging schemes. I get that. TFSA is too simple to believe at first glance. I’m doing two things differently from your diagram. I’ve added a savings account (I’m doing this with TD btw) that will be used to recieve the dividends, tax refunds and other extra cash which once a month will be applied against the mortgage. There’s no fee on the account if there are two or fewer withdrawals each month. The other thing I’m planning on doing is direct investing – rather than use a brokerage – with Canadian companies that have Share Purchase Plans. These companies also usually have DRiPs but I will only be enrolling in the Share Purchase plans and will have the dividends sent directly to my savings bank account where they will be applied against the mortgage. I don’t think you understand the SM – it takes *none* of your own funds to do the SM, so in no way does it compete with using a TFSA. Now, when you talk about RRSP vs TFSA, that makes sense. It takes no money for SM? You’re kidding right? You have to pay the mortgage. Yes you capitalize it, but it’s still paid from your pocket. I’m just saying it’s very high risk. It’s obvious most people don’t understand the risks. Tax free is always better. Your money grows tax free and you can access it any time you want. Tax free. It’s just too simple, I guess. With M1 you have two accounts Mortgage/chequing and Investment HELOC. FT has three, Mortgage, Chequing & Investment HELOC. I really don’t find the extra account or flowing money through it that great a burden. However, on a $200,000 mortgage, you would save $1700 anually in interest costs with the mortgage. I would have to work 13 months in a year to generate enough take home pay to pay that extra. I’ll happily spend a few minutes a month to save a months salary! My Mutual Fund investments were up 5.75%; real estate about 40%. Maybe you can explain the risks? Since you can hold the same investments in the TFSA and the SM investment account, I’m having difficulty seeing the difference in risk. You really should read Smith’s book. Thank you for sharing your experiences on personal finance and wealth building, especially your insights and experiences with respect to the Smith Manoeuvre. My girlfriend recently got a mortgage through TDBank, literally 2 weeks ago. Is there any way possible to try and structure a Smith Manoeuvre arrangement in order to have the mortgage payments tax deductible and taking on a HELOC? I’m entirely new to this, and I’m genuinely excited that I stumbled upon your blog upon searching through google :) I’ve subscribed to your feed. Thanks again for this great content FT! I’ve read the book, installed the software, and run the numbers on SM. A great idea if you understand that you are borrowing money to invest. If you don’t see risk in that, then you will never see risk. Good luck to you. Let’s take your 5.75% gain in mutual funds as an example (good return for the past 12 months BTW). If you borrowed that money, your gain would be much less, as you paid interest, and interest on the income and dividends generated etc etc. Sure you can write off part of the interest. Is it worth the risk to get the kind of return you are left with? BTW the TFSA is not an savings account. You should do some reading. You can buy and sell as with an RRSP for example, and sell whenever you wish without paying tax. Guess what, if have a large capital gain, you pay tax. With the TFSA you don’t. Actually, I am fully aware of the short term risks of leveraging, but I do enjoy a lively discussion, and will happily play the devil’s advocate on just about any topic. However, there are some I am more passionate about! I have challenged both sides of the SM debate over the past 18 months, as well as ETF-based portfolios vs quality managed portfolios. My Mutual Fund returns are largely due to my contrarian view about precious metals and petroleum (much advice said “sell”), and avoidance of the US market for the past 3 years. I am still trying to decide if I am truly comfortable with leveraging for the long term. I do wish I’d jumped on the local real estate scene a few years ago, but hindsight…..
Should you find yourself in my town, I’ll stand you a pint of Kokanee, and we can BS late into the night! This chart is amazing. Thanks for making everything more clear. I’ve been reading the articles and comments on MDJ for a while and found most of them very useful. I am still investigating the correct approach for my SM strategy. I have a single question: Which cash flows can be automated? For example, is there a way to automate dividend flows from the discount brokerage account to the chequing account? I would guess maybe interest and “capitalized interest withdrawal” between HELOC account and the chequing account might be automated. For me, the only thing is that automated is the regular mortgage and HELOC payment. The HELOC withdrawal and dividend mortgage paydown is a manual process. There is a trick where you can get another LOC and assign it to be the account that pays your HELOC, but set your HELOC as the account that pays your LOC. That way, both accounts will automatically pay each other, and you get to claim the interest on both. I would never drink Kokanee, unless it was (tax) free :-). We frequently raise a pint at the Brewery! Did you want to mention which discount brokerage you are using? I’m curious to understand if they charge any fees to have monthly withdrawals (dividend payments) taken out. CF, most of the discount brokerages that I know allow at least 1 free withdrawal / month. IB, E*Trade, Questrade, CIBC all do anwyays. I just knew about the SM a week ago. I have a question about the divident received from invest account. Is this TAX free in SM Money Flow? Or I have to report as divident income during income tax return? Dividends in a non-registered account, like the leveraged sm investment account, is counted as taxable income. Note though that dividends may be taxed at a lower rate than other forms of investment income. FT, I have created a similar diagram showing the flow of money for a sample M1 account. I actually implement this flow of money each month. The surprising thing about the SM within a M1 is the ease of use. Anyone interested in the ppt slide let me know, but you will see on it, that basically all income streams (dividends, tax returns, income minus expenses) are handled exactly the same only the amounts differ. To confirm the number of accounts it takes to implement. I use the main M1 account(for all the transactions), a sub for mortgage, and 1 sub for investments. However if one desired a less clean paper trail it could be done with the main account and 1 sub for investments. The only other account needed is your investment account where ever that may be, since it can vary wildly depending on your investments I just generalize it to a non-reg mutual fund, a reg mutual fund and perhaps a reg savings account. No complicated setup is needed such as with 2 Chequeing accounts, a HELOC and a Mortgage such as with the BMO example given above. The question I have to ask, is whether the example above is too complicated for the average homeowner to implement. I don’t mean because of the number of accounts as most people have several, but the complicated tracking and xfer of funds to and from the investment chequeing account is beyond most peoples time and effort. In my opinion anyways. Hey Kris, thanks for the feedback. You are right, the SM is a bit complicated and really isn’t meant for the typical homeowner. The reason why I go through all the trouble is to keep a clean paper trail in case of a CRA audit. The M1 may be convenient for the SM, but I would rather go through a bit more trouble and save thousands with the BMO setup. All that is really needed with other banks is two accounts – the readvancable mortgage account containing the mortgage & HELOC, and a transaction (chequing) account. Money comes into the chequing account is transferred to the mortgage; the value of the principal appears in the HELOC, and you invest a portion of it. Pretty straightforward. If you can take a screenshot of your powerpoint you can host the image at imageshack.us. Or, you could also use Google docs to host the presentation material itself (never tried it but basic Excel sheets host their nicely). Did you implement this in March? How do you handle the HELOC interest? I was under the impression that BMO would not capitalize the interest as you have shown in the diagram. The beauty of the SM is that should not require additional monthly cash flow (with a Merix or FirstLine I think), but the banks want the monthly HELOC interest payments (which is obviously in addition to the original mortgage payments). Can you clarify please? Steve, I don’t know of any readvanceable mortgage that capitalizes the interest automatically. What I do is have a balance sitting in my chequing account to pay the automatic heloc interest payment, then manually withdraw the same amount from the HELOC later. One of the steps I found confusing about implementing the SM is you invest a smaller amount each month, as you have to leave an increasing interest payment amount in the account to cover the investment loan. If you don’t include this step, the investment loan increases in size, as the interest is added to the balance. Since the premise of the SM is to NOT increase your borrowings, this monthly adjustment is needed to stick to Smith’s original thesis. Do you mean you are putting all your investment transactions in your main account, together with all your personal expenses? This is dangerous for tracking, especially for transactions such as monthly regular investments, interest capitalization or withdrawals/redemptions from the investments. This would also mean that your entire chequing account needs to be shown to CRA in an audit of your SM. With M1, to do it properly, you should manually transfer every last investment transactions to and from the investment sub account. That makes it far more complex than other banks for the SM. If you are familiar with the M1 it is setup so that only the Main account has access for direct payment/withdrawl or ATM access. All transactions come thru this account, then the debt/surplus is moved to the respective subaccount. The trail of transactions is fairly straightforward from my perspective. Mutual fund withdraws x amount from my main account, I xfer that debt to the subaccount 1:1. Seems simpler to me than the setup I would have with my RBC account where I would have to leave a balance in a seperate cheq account, then top it up after each withdrawl. This of course defeats the purpose of a M1 as excess/lazy cash is used to pay down the interest on the mortgage. I’ve never been audited so I am uncertain, but if audited would the CRA not have access to all your bank accounts anyways, and be able to examine your personal expenses? If the goal is simply to avoid this like you said, I’m not sure if that can happen. If I wished with the M1 I could open a PC financial no fee cheq account then use that to pay the investments, then top it up from M1 but I don’t see the need. The subaccount for investments clearly shows the month the interest was charged and the paper trail for showing the debt xfer is easy to follow. Comments? I do not have an M1 nor any readvanceable mortgage product so I’m only guessing here, but it seems to me that it would be much cleaner to have a separate investment LOC that handles just investments. I know that some readvanceable mortgages have a small list of subaccounts while others have 99. Thus, when I implement the SM, I will have my mortgage account and an investment LOC subaccount, under the HELOC, joined with our already existing chequing account. If in the future I need to borrow money to purchase a car, then I will create a new subaccount under the HELOC for that. With the M1 as Kris describes it still seems that there is one central account, the main account, from where all transactions originate. It may not be a concern but I like the cleaner (in theory) approach of a traditional readvanceable mortgage. Here’s my attempt at using google docs as well to share a ppt slide, let me know if it doesn’t work. Shows an example how someone could use the M1 to manage investing using the SM. Thanks again, FT, for the diagram and explanation. My first HELOC payment is due in just over a week. We went to BMO for their Readiline product (thanks again Ed Rempel) and IB for discount brokerage (due to the low margin rates). One interesting thing to note – the statement from BMO for the interest due portion on the HELOC was not extremely clear that it was already set up for pre-authorized debit. I’m so used to seeing bill payments that put it in bold letters near where the amount due is placed. For BMO’s statement, they have it at the bottom of the transaction details. I wasn’t totally convinced that I didn’t have to make a manual payment but one call proved that it was set up for automatic payment. Now, it’s off to the banking website to set up a scheduled withdrawal from the HELOC to pay itself the interest due! I have a Scotia STEP and i haven’t yet withdrawn any funds from it. When I do, will the minimum payment be the interest only or the usual 3%. if it is 3%, can i still do the Smith Manoeuvre? Fadi, typically HELOC’s will allow for interest only payments, however, you’ll have to double check with your banker to make sure. My wife and I own our house together. My marginal tax rate is much higher than hers. Regarding SM, is there a way to save my tax only? I’ve set up an SM with BMO and Interactive Brokers (IB). The problem is that the dividends produced from my investments at IB can only go back to the funding account or else I have to wait 60 business days. The funding account is the HELOC attached to the BMO Readiline product. What I want to do is apply the dividends against the mortgage portion, reborrow from the HELOC and then send them back to the IB for reinvestment. One option is for me to do the following steps – will CRA be okay with this trail and allow me to claim the interest deductibility? 4. I then reborrow that same amount from the new room created at my HELOC and send that to IB. 5. I invest that amount at IB so that it is now deductible. I hate that this is convoluted but there is no way that I can send a payment from IB directly to the mortgage since BMO won’t allow it. I can’t send it to my bank account directly unless I’m willing to wait 60 days. As it turns out, because it took me awhile to find opportunities to invest and generate significant dividends, I can wait another week and the 60 day threshold will be met. At that point, I can send it to my bank account directly. What I don’t think will work is sending it to the mortgage directly. Why? Because in order to ensure that there is an EFT link between the two accounts, IB sends some money (less than $1) to the account AND withdraws money from the account. With my BMO mortgage you can’t apparently send money to it except from the BMO linked savings/chequing account and you certainly can’t remove money. I hope this helps anyone else in this particular situation trying to achieve the same results. This is a very good site with lots of good and useful information. I am very close to setting SM based on the money flow diagram shown here and have a simple question. You have shown in your diagram that the investment funds should be funded from BMO HELOC to brokerage account. If fund from BMO HELOC to BMO Checking account and from BMO Checking account to Brokerage Account, would that be still okay from revenue canada tracking point of view. The reason I want to do it this way is my Checking account (for using in SM) is ready and I have that already linked with my brokerage account. However my HELOC is just getting approved and will be set-up sometimes next week. What they said is that once it is setup next week, then I can order the checks which will arrive in 2 to 4 weeks and then I can use that to link it with my brokerage account. However based on the current situation in stock market and 10%+ dividends, I want to get in to market sooner rather than waiting for about 4 weeks. Universal Trader: Thanks for the kind feedback. Ideally, you would fund your trading account directly with your investment loan. However, if you have a separate chequing account with very little personal activity, that would be ok as well. If the chequing account is a personal account with a lot of activity, then make sure you have a clear paper trail showing how the money is flowing. You should double check this with an accountant however. Is Cash Flow Damming officially dead? I have a couple of rental properties and was going to implement it, but the more I read, the more I’m unsure if CRA is allowing it. What are you reading? The Cash Dam is specifically mentioned and allowed by CRA in IT-533. I have seen quite a few advisors use the Cash Dam as somehow an explanation that allows an investment loan to stay deductible if you take ROC distributions out of a fund. That doesn’t fly, but that isn’t Cash Dam. Using Cash Dam with rental properties works well to make your home mortgage deductible. Thanks for the quick reply. I read one article in specific where Smith said he wasn’t going to be recommending it after the Lipson decision….and then all the naysayers started blogging! At any rate, I read IT-533 and, trying not to be daft here, but the mechanics for me would be – pay eligible expenses from HELOC, draw on property revenue for lump sum on personal mortgage portion of HELOC…right? I read that quote from Fraser and have not talked with him since then. I’m not sure exactly what he means, but he was advocating mutual funds with ROC distributions. I took his quote about Cash Dam as referring to this, since I believe he had been using Cash Dam as an explanation for the ROC process. Anyway, it works perfectly for rental properties and nonincorporated businesses. It is purely a tax strategy – not an investment strategy. Your mechanics sound exactly right, Alan. Based on the SM Money flow diagram shown here, if I make a capital gain in my discount brokerage account, but do not withdraw that gain and simply re-invest it, then will I still be able to claim all of the interest paid on the originally borrowed money? Universal trader, as far as I know, providing that you keep the capital gains within your account, you can still claim the interest from the investment loan. How do you keep track of how much the interest payment will be for the current month. It will always increase, and I can see myself making errors on the amount if I calculate it myself. Do the LOC’s have automatic interest payments where the bank will automatically pull the funds out of an account? Tron, yes the payments due for the HELOC are automatically withdrawn from a pre-assigned chequing/savings account. I have my HELOC setup and now I am trying to open Etrade account, but they told me that they could not withdraw money from my HELOC account, only fromsaving/chequing account. Tyler, if your bank can support a bill payment to Etrade using your HELOC as the funding account, then it should work. Hello. I’m not a finance guy, so I want to make sure I have this nailed. Using our example, we have a 120k HELOC setup at 2.5%/a. Mortgage is locked at 5.79%. We’ve pulled 100k of that into investment bonds returning 15%/a, paying out quarterly. Our first quarter payment came in and it was only 2 months worth, so we held that in the tracking account to pay the HELOC interest costs. I’m debating whether or not I should “capitalize” that interest by pulling that money back out of the HELOC, and getting back up to the original $2500, or just leave it at the eroded amount. Now, our second interest payment has arrived, and I’m ready to get this into full swing and make a mortgage payment. So, assuming I capitalize that interest, I’ll have $6250 in the tracking account. So, I’m thinking I withold the 40% for tax, make a mortgage payement of $3750, pull 10k out of the heloc and reinvest it, and go on my merry way till next quarter. Rinse, repeat. All the while, we’re still making our accelerated payments of $700 into the mortgage. So, am I on track or have I botched this? Mortgage at 5.79%??? That is ridiculously high. Most likely, you will benefit by paying the penalty and getting a new mortgage. We are getting between 1.99% to 2.3% for 1-year fixed today. What kind of investment bond are you referring to that pays 15%? That must be a high risk investment and is likely unsuitable for the Smith Manoeuvre. It is a leverage strategy, which already magnifies your gains and your losses. Using it to invest in high risk investments is extremely risky. You’re right on the first part. I called Firstline today and we’re going to be renewing at a much lower rate. We were initially locked in at 5.79 when we activated the matrix part of the mortgage, but they’ve changed the product now so we’ll be a Prime-1. As for the second part, it is risky, but I’m comfortable with the investment, and the manager so I’m willing to accept it for now. Does anyone know of a chartered accountant in Montreal (pref. West Island) that knows how to set up proper accounting for cash damming for a self-employed work, i.e. real estate agent. Prime -1%? That interest rate is not available now. Do you mean prime +1%? I would recommend to avoid variable rates for now. We believe that mortgages with big discounts from prime will be available again in a year or 2, so stay short. You will probably regret locking in to a mortgage for 5 years that does not have a big discount from prime when those become available again. I would suggest to stick with 1-year fixed for now and enjoy the amazingly low 1.99% rates available now. If I want to capitalize the interest but the interest payment for the HELOC is withdrawn automatically from my chequing account then how does it work? Brenda, at that point, simply withdraw the same amount from your HELOC back to your chequing account. I read on a previous post that you were implementing the RM formula. From what I understand this uses your principle paydowns to pay for interest on a seperate LOC. How would you include the RM LOC payments into the diagram? Is it necessary to create 2 seperate brokerage accounts? Have a look at my uploaded flow diagram and see if it jives with the RM SM. @James, you’ll have to refer to Ed Rempel for that question as I didn’t implement the RM after. I just noticed your post. Your drawing is fine, except that you don’t really need a separate credit line for the Rempel Maximum. The Rempel Maximum is the maximum benefit you can get from the Smith Manoeuvre without using your cash flow. You start by borrowing the maximum amount to invest that the principal portion of your mortgage payment will cover. For example, if your mortgage payment pays $500/month of principal, that would cover approximately $150,000, depending on your interest rate. You should allow a bit for interest rates to rise. You can borrow from one credit line or from a credit line and investment loan, depending on your situation. I’d be interested in see your ppt slides if you still have them. Are you still using the M1 account for SM? Question about capitalizing the interest from HELOC..so if I withdraw from HELOC to fund the interest payment every month (though still tax deductible) say $100 for the outstanding balance, say $40,000.00, the outstanding balance of my HELOC will increase by $100 the following month on top of the original borrowing amount, so it will become like $40,100.00? Please comment. Thanks. @SK, yes, your HELOC balance will increase by the amount of your required payment. What happens if you max out your heloc? how can you capitalize interest then? If the HELOC is maxed out, you have three options. Pay with your existing cash flow, use another line of credit to service the debt, request that the bank increases your HELOC credit limit (fees may apply). Personally, I would leave a buffer in the HELOC to service the debt. I am planning on implementing SM in the next couple of months, while I will consult with a tax accountant I have a question about brokerage fees. Let’s say I borrowed from my LOC 10K this year and invested in stocks (with Questrade). I paid $50 in brokerage fees. What do I do with the $50 when bought the stocks? I know from reading CRA’s website that when I sell the stocks and have (let’s say) capital gains, I can use the brokerage fees when calculating the ACB value of the stocks. But what happened to the $50 I paid when I bought the stocks? To answer my own question, the brokerage fees (buying and selling) go into calculating the ACB of the stocks. And I can’t deduct the amount I paid for the fees, but I can deduct the interest on them. In case anybody’s interested in that. Hello, this is an amazing post with equally useful comments and questions – many thanks for posting and answering all the questions so far. This is about capitalizing the interest, if I look at post #85 from Brenda and your answer (#86), how is it capitalizing if your HELOC is going up by the amount your are withdrawing, what part of that 100$ actually get capitalized and how/when/where etc…? Sorry again if this is very obvious to everyone here, just don’t understand :). @Sid, your HELOC will charge your interest only. Assuming that your HELOC was only used for investments, the interest that you are charged is taxed deductible. For me, the interest is taken out of a specific checking account every month, say $100/month. So, in turn, I login to bank account online, and transfer $100 from my HELOC to “pay back” my chequing account. Thanks FT for the quick response. So if I understand right, assuming that you started of the year with a balance of 10000 on your HELOC, you would end up with a balance of 11200 at the end of the year and what you’re saying is that the 1200 is tax deductible? Assuming the above, do you get the whole 1200 back after filing your taxes or just part of it? “Capitalizing”, in this context, means to add it to the loan. If you start with $10,000, the interest is probably closer to $30/month. You can have the HELOC pay its own interest, but you have to do it manually. The bank will take the interest from your chequing, but you can repay your chequing by transferring manually from the HELOC. You should transfer the exact amount back – to the penny. The reason is that, in case of a CRA audit, you would need to show that all the amounts from the HELOC were invested (and remain invested) or where used to pay the interest. The tax rule here is essentially that if interest on a loan is tax deductible, then interest on the interest is also tax deductible. Being deductible does not mean you get it back as a tax refund. You can claim it as a deduction on your tax return and then your refund would be based on your tax bracket. Does that make it clear, Sid? * So on until the 12th month, the bal. of HELCO will accumulate to $103,660.00, and monthly interest will be $310.98. So the balance of HELCO and monthly interest is growing every month. The loan will grow although the original investment is only $100k. my HELCO is from RBC, does RBC allow me to capital interest this way and will RBC bother to calculate different interest every month? if yes, the annual interest paid $3670.98 should be all deductible, right? I noticed from your diagram that Dividends (from Investments) and Lump Sum payments (in Main Account from I assume tax returns) both went towards the BMO Chequing (your SM account). Then went towards Mortgage pre-payments. *Is that necessary to keep it all CRA friendly? This reason I ask… If you have “bad” debt still hanging around in the form of LOC / CreditCard / Loans, can you apply the Dividends & tax returns to that? *I know the point of the SM is to pay the mortgage down quicker, but would it make sense to eliminate the bad debt first. Once that is under control, then start accelerating the pre-payments? You can do whatever you want with the dividends. So yes, you can apply the dividends towards bad high interest debt.